Colour coded plastic attachments and nose clips ensure easy identification [green for FFP1, yellow for FFP2, red for FFP3] and help the user to select the proper type. The ergonomic design, soft material and optional exhalation valve provide comfortable and economical products that can be used for all applications. The foldable Affinity FR line is available in FFP1, FFP2 and FFP3 versions. All versions meet the requirements of EN 149:2001, providing the best efficiency against most penetrating solid and liquid aerosol particles, depending on which class of filter is used. The low-profile design of Affinity FR makes it ideal for use under welding hoods or in any tight spot where a respirator must be worn. 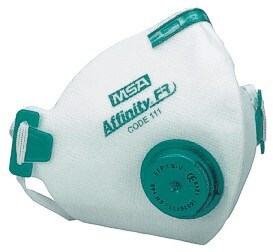 Affinity folded respirators also offer one-size-fits-all convenience without compromising effectiveness. Unlike other folded respirators, Affinity FR are folded vertically, providing a more anthropometrically correct face seal. The smooth inner lining of the Affinity FR provides a tight seal. A pre-shaped nose clip allows for easy contour adjustments to achieve a snug fit that prevents exhaled breath from escaping and fogging safety glasses. The elastic band ensures a good tight fit for all face and head sizes. The optional exhalation valve lets the exhaled air out for easier breathing and keeps the respirator cooler. Affinity FR is dolomite tested to guarantee better breathing comfort, particularly in high dust environments. Because they are individually wrapped, Affinity FR can be carried on the job,when not in use. Even in dirty conditions, it will remain free of dirt and debris. Due to its small size, the respirator fits in your pocket, ready for use. To further enhance durability and make donning and doffing a snip, high quality plastic attachments secure the elastic strap firmly to your respirator. Special Odour Removal versions offer relief from low concentration levels of Acid Gases [including HF], only below TLV [nuisance levels].